Where can the kids enjoy water splashing activities the most at home? 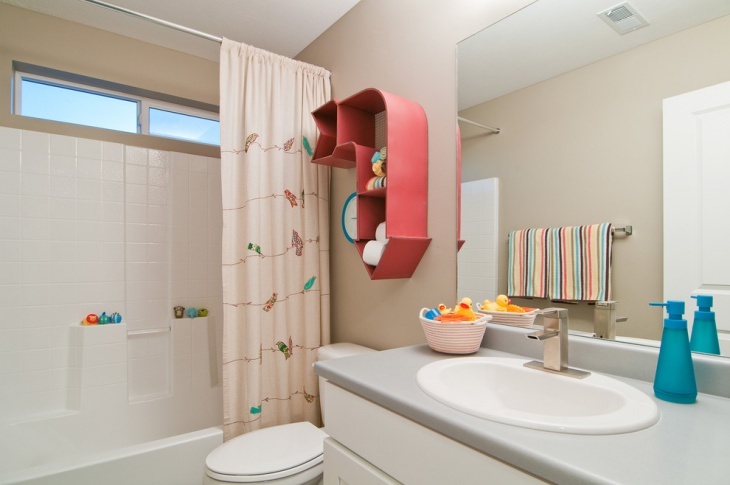 Of course, a kids’ bathroom with all the innovative kid stuff, colorful and buoyant bathroom accessories and decor can give the kids the best cheerful bathing experience. 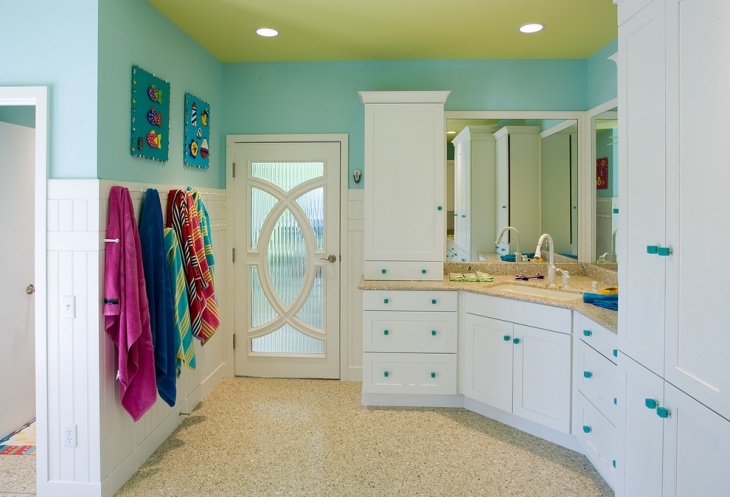 Some superb kids bathroom decor design ideas given below are worth adopting for your kids. 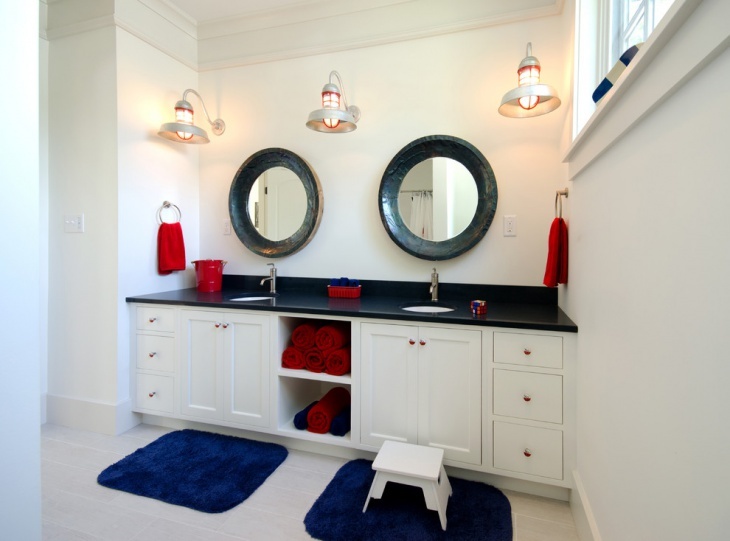 A simple bathroom with a big mirror, some colorful kid’s toys, and extravagantly shaped towel storage area in the dressing area gives a contemporary look to the kids’ bathroom in a minimalistic manner. Nicely designed shower curtain with character prints also gives a cool and upbeat designing. Small kids love animals and hence, wall decorations with animal pictures or some cute posters can be an interesting decor idea. 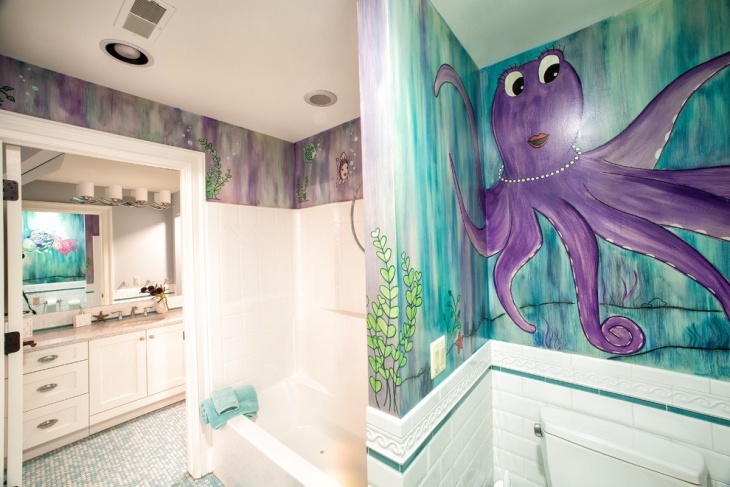 The colorful wall art designs increase the entertainment factor in kids’ bathroom. 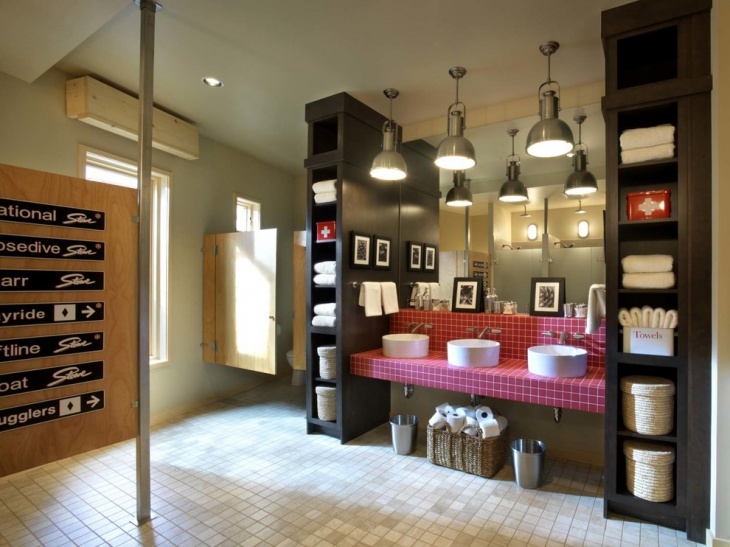 The toilet area can be combined in larger batrooms. The matching color mats also look elegant. 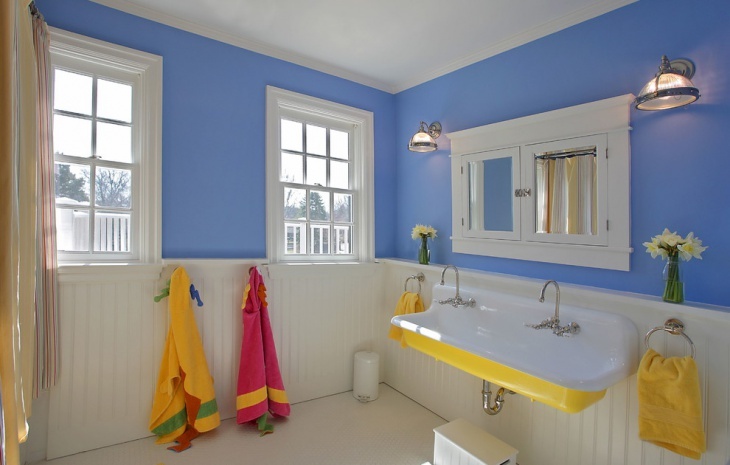 The color combinations sometimes can create a magical effect like blue and white walls for a kids’ bathroom. Besides, cute small glass windows, mirrors, hangers for towels and some bright decorative lights in the basin area can look remarkable. 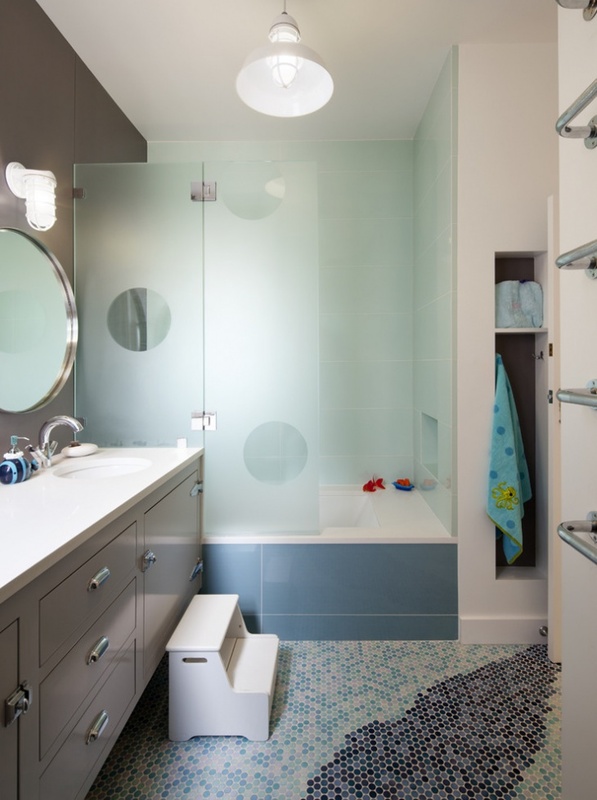 The decorative tiling and a separated bathtub shower area with a glass pane can give a luxurious and classy delight to the children. 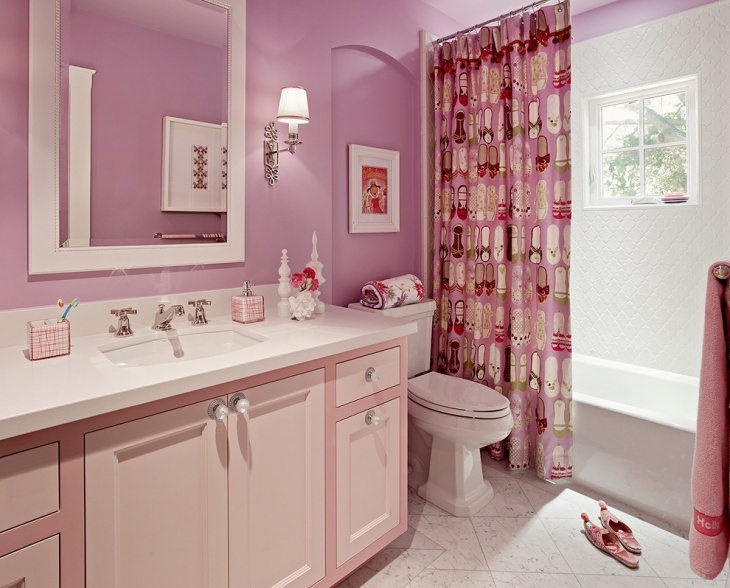 The girls adore pink color, hence using different shades of pink can create a definitive chic kid girls bathroom. The girl will feel no less than a princess on seeing the pink shower curtains with a lot of feminine designs like Barbie shoes. A nice dressing table with storage and mirror is a must. 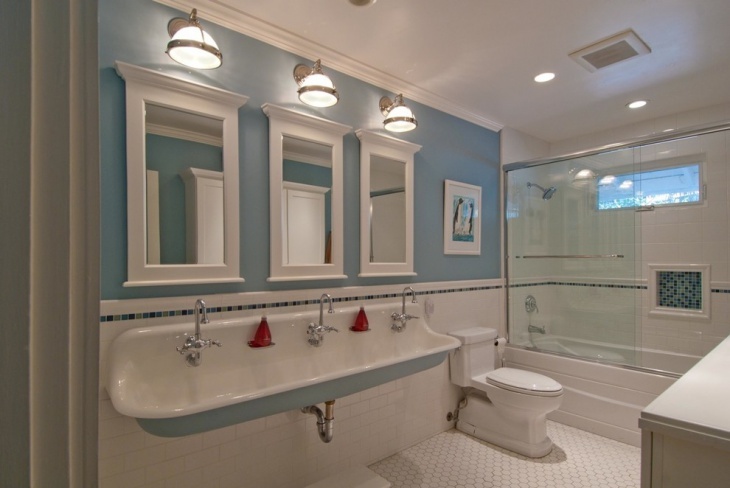 There is nothing like a colorful bathroom with granite countertops, some floral wall art, a small bathtub, colorful pot with flowers and fancy ceiling lights. The kids get the animated environment and an exclusive bathing experience here. 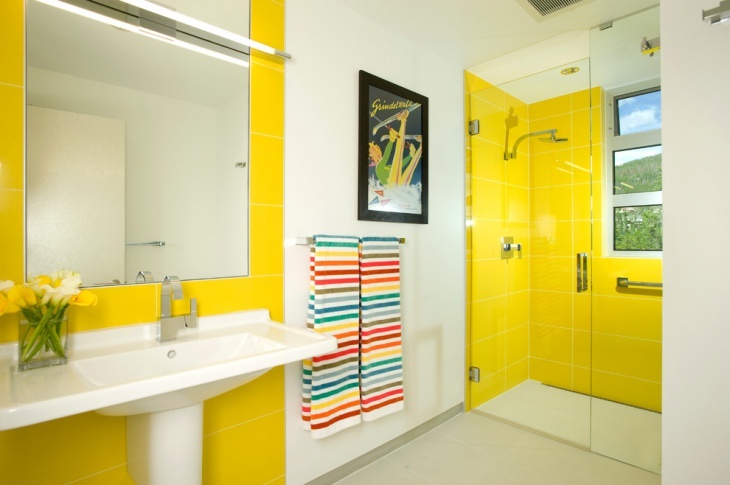 The bathroom ideally set up with some bright color walls and countertops in colors like yellow, red can set a happy mood among children early in the morning. 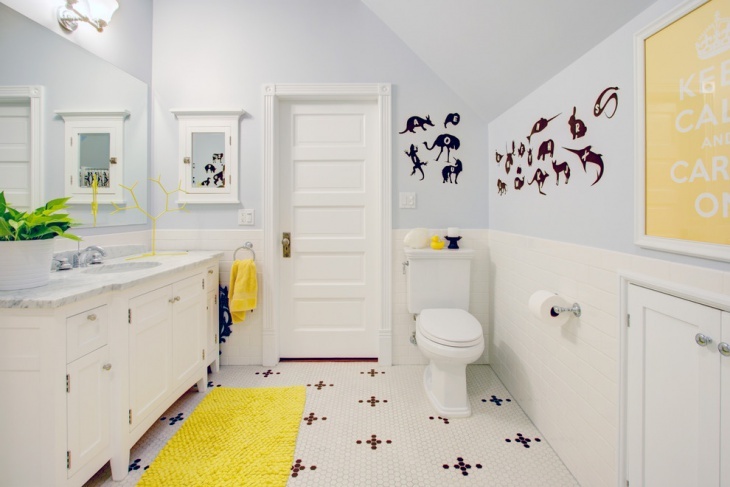 Right from brushing the teeth, bathing, and rest of the toilet chores can be done with great pleasure in a nice kids’ bathroom having a blue and white beach style color pattern on the walls. Some greens in the dressing area give a nice contrast effect. 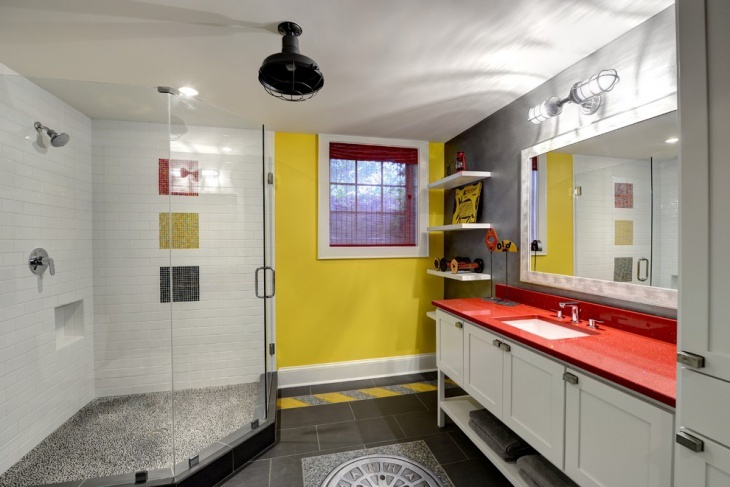 When the kids’ bath items are so colorful, adding vivid colors like yellow and white to the whole bathroom can be helpful. Such bright colors add dimensions to the imagination power of the kids. 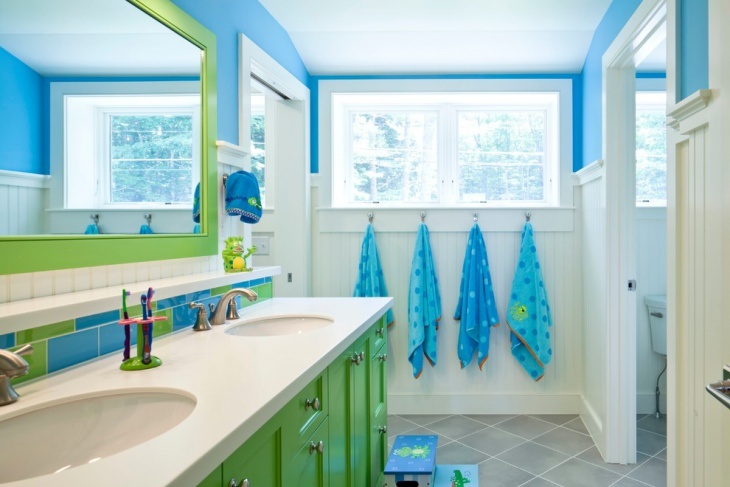 Such colors and designing can make a funk brat easy to handle as he will enjoy the bathroom ambiance and have a fun time inside the kids’ bathroom. 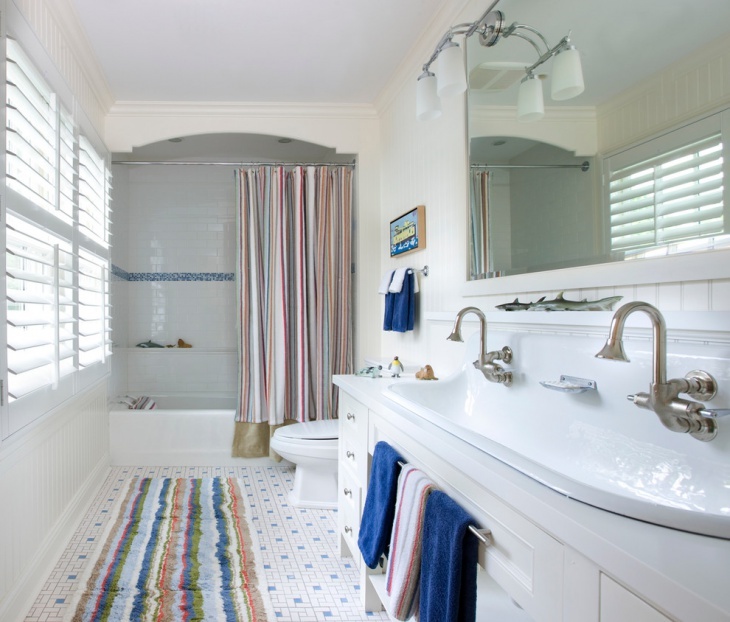 With some multicolored bath mat, napkins and shower curtain, a simple white bathroom can get a lift and a child-like makeover. 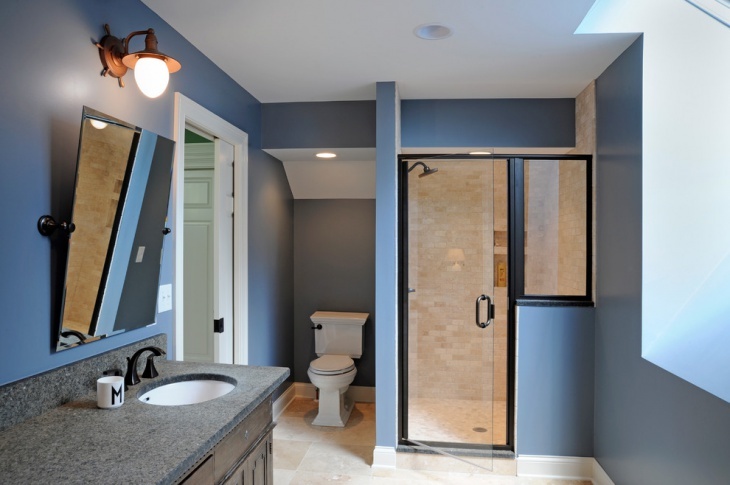 Long basin and big sized mirrors with twin designer lights can increase the awesomeness. 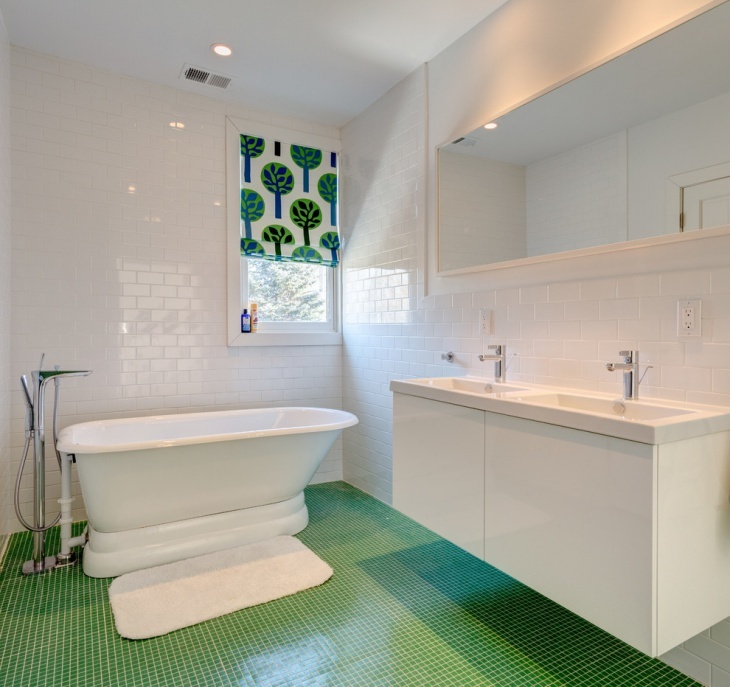 The soft designs and colors on white floor tiles also look exclusive. The kids delight gets a vent in an exclusively designed kids’ bathroom. The colors and glamor can be further added by the colorful bathroom accessories, wall art and shower curtains.